Our online flower shop delivers flowers to all towns and cities in Malta from anywhere on the planet. Our florists in Malta have been delivering flowers with a touch of class since 1978. Send Malta flowers to any place in Malta which is easy and secure. Malta has a long summer where it is estimated that more than half a million people visit the island by air and sea in 3 summer months. During this time the Malta florists also deliver many flower orders to yachts and cruise ships in any Malta port. The Malta florists are consistent in quality, have a passion for floral design and exceptional customers made our flower business bloom. Today, our team of internationally trained flower designers are committed to craftsmanship, artistic designs, and immaculate flowers as were those young entrepreneurs in the late seventies. The Malta florists are also known for quality and unique design. Our flower delivery services to Malta have full coverage nationwide. With a number of daily flower deliveries going around Malta every day, you can be sure that we get your flowers in Malta on time, every time. Flower deliveries to any Malta Hotel require recipient's correct name and where possible a room number. The names can be also registered under family or friends which is important to advice in our website's order form in the remarks box. 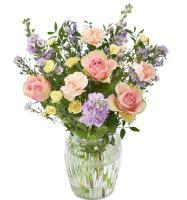 A Malta local telephone Number is required for all flower orders. The last guarantee deliver date for Christmas, Mothers Day, Easter and Valentines Day is 2 or 3 days before. Order Valentine flowers to Malta!